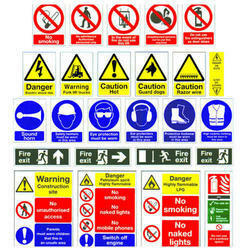 Wholesale Trader of a wide range of products which include safety signages. Design – The design of the sign itself often needs to meet standards. This includes the shape and size of the physical sign. One key point in the design of safety signs is that the edges must be rounded to ensure there are no sharp edges that could result in cuts or other injuries.Application – Where, how and why some signs can be regulated. For example, you can’t use a sign that uses well known fire hazard wording or symbols in an area where there is no fire risk. Use of Symbols – Many symbols are regulated by OSHA. These regulations typically mean that they require the use of specific hazard symbols in specific situations. Symbols can include pictograms as well. Safety Sign Wording – When using actual words on the sign, you must follow the set wording requirements. Like symbols, this only applies to certain situations where they have a standard in place. Lettering – The size, color and font of the lettering on signs needs to be in line with OSHA standards. Posting Location – Some signs need to be placed at certain heights, for example. In other cases you will need a sign placed every set amount of distance to ensure they are seen.